Those of us who sail have learned many things on a boat besides the names of various pieces of hardware, how to tie knots, and sailing terms used to communicate among crewmembers. We might not always realize that we have learned and continue to learn beyond the physical boundaries of the boat, but we do, and whether you sail together as a family, or are part of a crew on a race boat, here are some of the beneficial things that happen aboard a boat which can translated to real life experiences and events. These lessons are fitting for kids and adults alike, and are but a few of the reasons that sailing is a great way to spend leisure time. Sailing teaches us to be prepared. Because there are always some unknowns involved with being on the water, we learn to be ready to anticipate and deal with things that we might not experience at home, school, or work. A prepared sailor will likely be more prepared for unexpected things that pop up in everyday life as well. Sailing teaches teamwork. If the crew on a sailboat doesn’t act as a team, the boat will not perform to its fullest potential. Everyone on a sailboat must work together to make sailing easier, faster, and more fun for everyone aboard, which helps us to learn the importance of working well with others as we go through our daily routines. Sailing teaches patience. If you’ve ever been trying to reach a port that is in sight but the wind is dying or changing directions, you know and understand the importance of being patient and dealing with the situation. Oftentimes in these situations, you learn alternative ways to play the cards you’ve been dealt. Sailing teaches decision-making. If you’re in charge of a boat, you will be making decisions for the good of the boat and the crew, and you have to learn to make the right ones so that you can get to your destination safely, quickly, and have fun doing it. Your crew will appreciate the fact that you are making the right choices, especially in less than ideal sailing conditions. Sailing teaches communication. Once you make those decisions mentioned above, it is important to be able to make your crew understand what has to be done aboard the boat to make things work the way they should. If you can do this on a boat, you can do it at school, at home, or on your job. Sailing teaches confidence. There is confidence in knowing that you have made the choices that make your boat move through the water in light wind, or to get you home safely when something breaks or when the weather turns ugly. You will gain the confidence in knowing that your knowledge of your boat and its environment will make the experience more enjoyable for everyone aboard. Sailing teaches responsibility. You, as a captain of your boat, are responsible for the safety of the boat and all aboard, and you are the person to whom they will look when the time comes do anything related to the operation of your boat. Sailing teaches honesty and the importance of playing by the rules. There are certain ways to act and things that must be done aboard a sailboat, and even more so aboard a racing sailboat. There are strict rules that must be followed to be successful, and you have to play by these rules, for there is honor involved, and no one who cheats in a race will ever have the respect of his or her competitors. This is an important lesson that is learned early by junior sailors, and one that usually stays with them for life. Sailing teaches us how to deal with the unknown and to operate in a constantly changing environment. The old saying – “You can’t fool Mother Nature” is especially true on the water, and sailing is a great way to learn that. We cannot control weather, and we don’t always experience the weather that we would like, so a sailboat becomes an excellent classroom for learning how to handle unexpected situations and changes on the water. This also flows over to everyday life, because if you learn to confidently and competently handle unknowns on the water, it becomes easier to handle unexpected changes that occur daily. These are merely a few of the beneficial lessons to gain from our experiences aboard a sailboat, and there are certainly many more if we think about it a bit. All the more reasons to learn to sail, get aboard a sailboat and start enjoying a lifestyle that is not only fun, but can enrich the lives of your entire family! To learn more about Mike Thoney. Three reasons why selecting Bermuda for the America's cup is a bad decision for the sport of sailing. In the next 24 hours, if the 'tea leaves' are correct, we will hear an announcement that the 2017 America's Cup will be held in Bermuda. If there was ever a clearer lead-in, granting the AC World Series event for 2015 to Bermuda is a clear indicator that San Diego is most likely not in the running. Many outside the sport might shrug this off as something you would expect. Sailing after all has the perception of being a sport of the rich and famous. A past-time reserved with those who 'have the means'. As an industry we don't do much to dispel those perceptions. 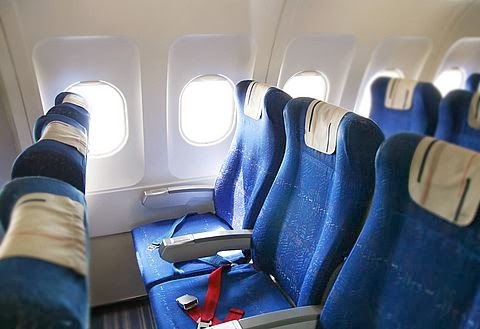 Certain aspects of the past time benefit from enhancing the perception, highlighting the high cost of participation and the luxury or exclusive aspects limited for the wealthy. 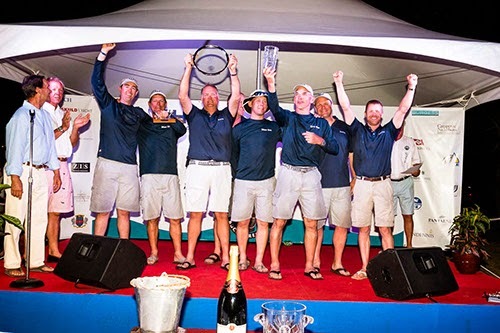 Moving the venue to Bermuda, while a tax benefit for the current winner, does serve to place some obstacles that further the outreach that the marine industry has been working on over the past five years through initiatives at US Sailing and the Recreational Boating Leadership Council. I'm sure there are some well thought out and valid economic reasons for why Bermuda was selected. Enclosed is my take on how these barriers might be bad for the growth of the sport overall. 1. Exclusivity: Placing the sport in a remote location, means that only those that follow the sport will watch it on web relay and tracker. While the 34th AC revolutionized this via the wizardry of Stan Honey, it presents a very one-dimensional appeal to the sport. 2. "Too rich for my blood": The remote location of Bermuda furthers the perception that you have to be someone special (albeit wealthy) to travel to participate and watch the sport. A rich man's playground if you may. After the last AC, I was amazed at the number of 'non- sailors' who got caught up in the final races. People in "car washes" recognized Team Oracle gear. Comments on how picturesque the San Francisco backdrop was for the race were echoed by many 'non-traditional' fans. 3. "Sailing is too god-like": The distance of a remote island and accompanying perception seek to further alienate the engagement of a younger diverse generation. The problem with that "island" approach is that it is generational and very limiting as it only seeks to appeal to those already in the sport. You see as the 76.4 Million baby boomers (born 1946 -1964) edge towards retirement at a rate of 10,000 per day they leave a participation void. 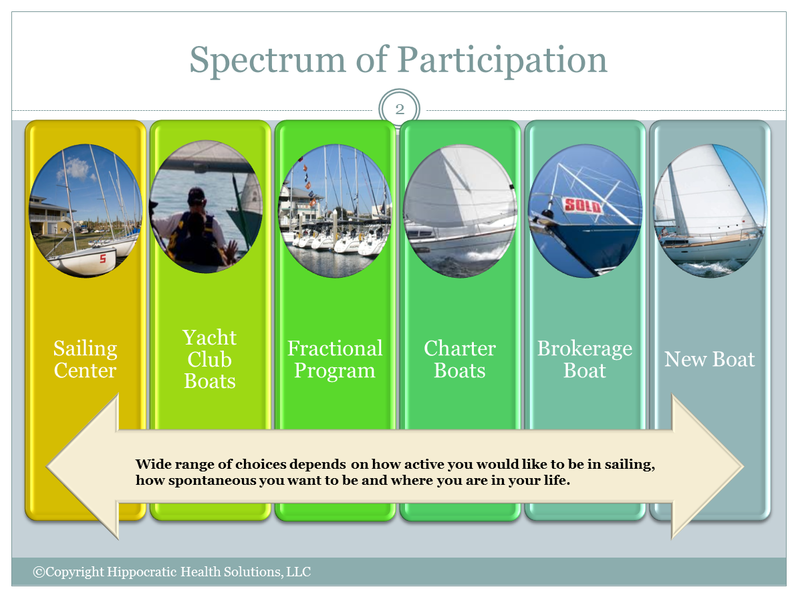 Behind them the engagement and participation rates for the sport of sailing among the over 50 million Generation X (Born 1965-1980) and over 56 Million Millennials (Born 1980-2000) toils in the single digits for historically mainstream participants. The National Marine Manufacturer's Association reports overall participation rate for 18+ year olds at 26-32% . This figure includes small craft and power boats as well. Coming off an exciting finish for the 34th America's Cup in 2013, the sport of sailing could have used this momentum to engage a whole new generation of American youth in the sport. I fully understand that there are far smarter people than I making these decisions and people with a far deeper legacy in the sport. Coming from someone who was exposed to the sport in my youth , but learned to really love it in adulthood, I see the move to Bermuda as one that may undo the work that many of us have been engaged in - exposing a whole new younger bloodline to the sport of sailing. Engaging a new generation of sailors who look and think much differently than those currently in the sport. This task seems to be a bit out of reach for now, far away on an island. Lou Sandoval is the Co-Owner/Co-Founder of Karma Yacht Sales, the Midwest dealer for Beneteau, C&C and Alerion boats. He was exposed to sailing at Boy Scout Camp in his youth and after a 17 year career in the biomedical industry he took on the role of entrepreneur and business owner by purchasing the boat dealership based in Chicago. He is active in the leadership of the sport of sailing and serves as an opinion leader in the marine industry serving on several boards that seek to expand the participation of sailing and boating. 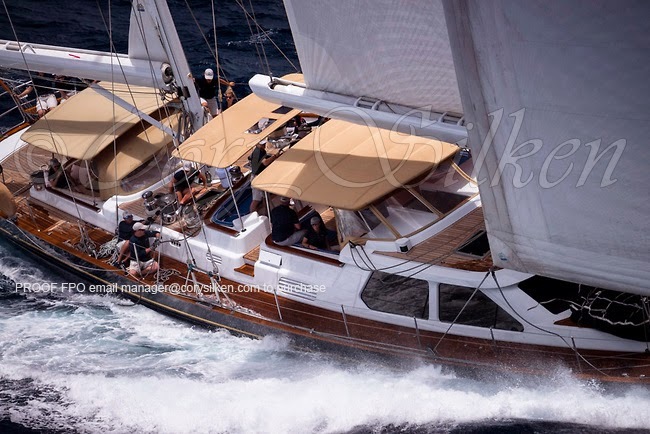 What is the new C&C 30 One-Design like under Sail? Take a look at this video and see. We are booking trips for prospective Owners this September to Newport to sail the C&C on the bay. Contact us to be added to the list and to receive the NEW C&C OD catalog. We thought we would start a series of DIY Posts called "Tuesday Tips" that walk you through some of the most commonly asked questions we receive on our service desk. This one is a recent one from one of our owners that called and asked about how to disassemble, check and lube his Lewmar Ocean Winches. While the specific disassembly might vary from brand to brand- the essential components of the winch are similiar and the routine maintenance should be done routinely (i.e. seasonally at minimum or if you race the boat perhaps on a bi-seasonal schedule). So at the end of the day, by spending a few minutes this Spring, you might save yourself a bigger headache or worst yet, a failure when you need them most. Spare parts can be ordered from Lewmar or Harken or obtained through your local ship store (eg. West Marine). Bring in a photo of the winch (smartphones are great for this) and know the size (usually stamped on the head of the winch. The videos we've enclosed here breakdown the process for each of the major brands of newer winches. You tube has an assortment of other makes models etc. 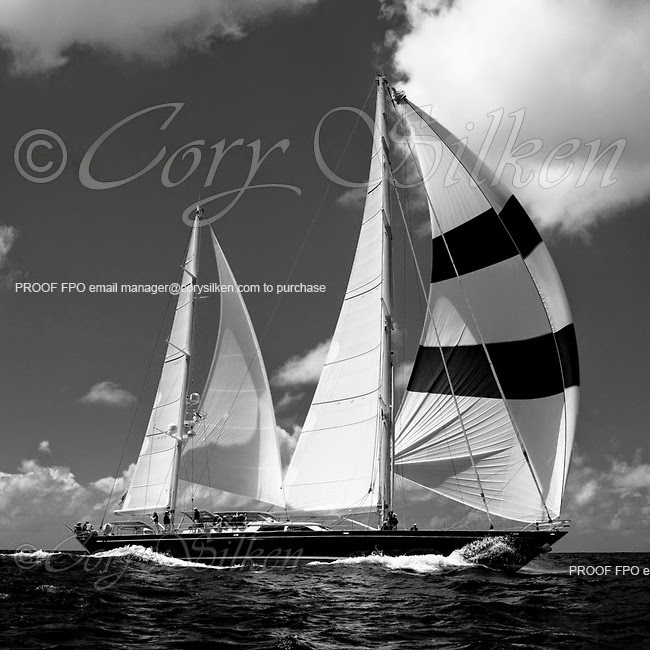 I recently spent a week in St. Barthelemy (St. Barths) in the French West Indies, performing as crew on a 112 ft. ketch-rigged Alloy Yacht (Ron Holland-designed) named Blue Too. This was the third year I have been lucky enough to crew on this boat for 'the Bucket', and it is still a bit surreal to spend a week in March racing in a Superyacht regatta, surrounded by some of the largest sailboats ever made (Maltese Falcon, Panthalassa, Seahawk, Zenji, Hyperion to name just a few) alongside some of the best, most prominent sailors in the sport. It is truly a week of fantastic sailing. What I love the most about this week is the reminder that sailing is completely a team sport and that camaraderie is something that sailing breeds better than most sports I have ever played. When you race sailboats larger than dinghys, you quickly get used to the fact that not much can be accomplished without good teamwork, acting in concert with one another. When you are on a 112 ft. boat that has all of its power supplied hydraulically, takes almost 2 minutes to complete a tack, and requires five crew 30 minutes to 'wool' a spinnaker, you become aware of how important each member of the team is, and that each 'job' has to be completed in order for the boat to accomplish anything, and has to be done nearly flawlessly for the boat to perform well. We on Blue Too have done very well in this regatta each year. In 2012, we ended up Third overall (2-6-2); last year we had to drop out of a race when a crew member was injured (he was injured but is now OK), but still finished Fourth (1-13-2). This year, the expectations were high, and we didn't disappoint-coming in Third (8-3-1). What this regatta offers a Lake Michigan sailor like me is a great deal of perspective; perspective on how different but how similar a boat three times the size of my own can be; how the camaraderie of our sport so easily transcends language, bodies of water, and level of experience - as most sailors are just great people, wherever you are. I consider myself lucky to have 'found' sailing, as it has provided me many memories, opportunities, successes, and even failures. This is exactly why I am in the business of helping others 'find' this sport/lifestyle, too. 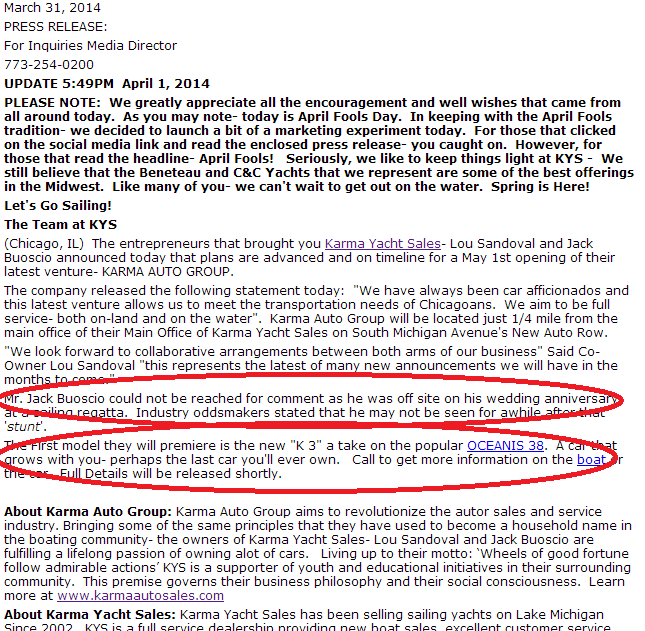 On April 1, 2014 Karma Yacht Sales set out to accomplish a few things in the form of an April Fools 'joke'. The 'joke' was launched in the form of a mock Press Release laced with Google Analytics to track the results and to measure to what level 'followers' on Facebook and Twitter would go. It sought to verify what they were liking or following and to what degree followers would read the 'prank' link. It was also a guerrilla marketing tactic as one of the outcomes was that it lead to increased web traffic originating from both social media channels - Facebook and Twitter. The post went live at approximately 10:32am on April First with the heading " PRESS RELEASE- this news broke late yesterday. Boat Entrepreneurs expand offerings. 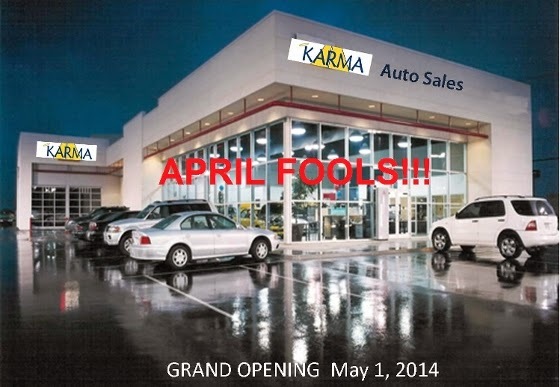 Karma Auto Group to Open May 1st." #getbusydriving #getbusysailing"
In the first 2 hours there were 800 clicks on the link out of 2300 views. 47 likes. 4 shares 12 comments. 10 comments without clicking on the link to read. Breaking down the Statistics: 65% of social media traffic resulted in views only. A smaller percentage (35%) actually took time to read the press release itself. 83% of the individuals that commented on the post did so without clicking through to read the content of the release. The post was amended at 5:49 pm that evening to reveal the April Fools prank with corresponding Facebook /Twitter posts. The 'prank' was the idea of Karma Yacht Sales Co-Owner Lou Sandoval who manages the marketing for the boat dealership and serves as the social media manager. "It was a bit risky- but in the end it reflects the light hearted nature with which we operate. We try to not take ourselves to seriously." said Sandoval "I got the idea from listening to an NPR story that morning. You really wonder if individuals really read what we put on our social media outlets." While the group is not looking to make any conclusions or correlations- it does provide an insight into what 'followers' activities might mean. To see the original Post/Prank. WING Sails- Are Not just for America's Cup Boat's Anymore! Post by Voiles et Voiliers.